Palm Beach Gardens, FL-Early this morning Everglades Earth First! 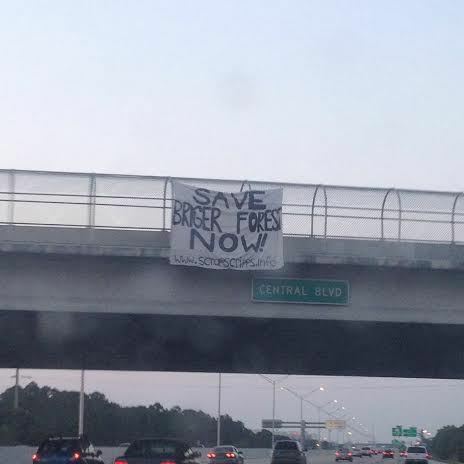 activists hung a banner over I-95 reading “Save Briger Forest Now!” to demand that the Briger forest be saved in honor of Judi Bari Day. Exactly 24 years Ago, Judi Bari, Earth First! Activist famous for defending the California Redwoods was bombed in her car while on tour promoting Redwood Summer, which called for people to occupy the woods to save them from being logged. Today, those in south Florida are faced with a similar threat, but it’s not for logging, its for the profit of development. In Florida, Pine flatwoods are practically a threatened ecosystem. The reason being it is much easier to develop than swamp, being naturally higher in elevation and dryer. Since 2009 the Briger Forest has been the top choice for Scripps Phase II Expansion. 682 acres which is predominately pine flatwoods is slated to be destroyed only to be replaced with a biotech city; where middle and upper class residents could work, live and eat all within it’s confines. June 5th at 7pm to voice their opposition to the destruction of the Briger Forest as they will be deciding on the first phase then. Since Kolter bought the property under the name Cotleur & Hearing, Inc. in December the project has had a lot of traction and push back. On April 10th South Florida Water Management District released its draft permits approving the project, but Rachel Kijewski and Panagioti Tsolkas from the Palm Beach County Environmental Coalition challenged the permit requesting an Administrative hearing. 4 days ago SFWMD updated their permit to reflect the need for a hazardous waste plan, but have ignored their other concerns regarding cumulative impacts, violating the Endangered Species Act regarding the Eastern Indigo snake, not providing sufficient evidence that it is in fact in compliance with the Florida Coastal Management Plan and more. Everglades Earth First! is the same group that blockaded the construction of the West County Energy Center in 2008, now the 2nd dirtiest CO2 power plant in the state, and has done direct actions since then to highlight the major threats to the Everglades ecosystem. In 2009 EEF!ers occupied the Barley Barber Swamp to highlight the killing of an old growth Bald Cypress swamp surrounded by Martin Power Plant’s many mile cooling Pond. In 2011, many EEF! protesters lived in the Briger Forest, and some sat in trees along I-95 to gain public awareness about the destruction posed for Briger. In 2012 during the Republican National Convention, EEF!ers blockaded the entrance to the TECO coal fire power plant the dirtiest power plant in the state according to a report called America’s Dirtiest Power Plants released in September 2013 (ranking adjusted due to Crystal River plant being offline). Now two EEF!ers await trial for blockading the entrance to the headquarters of Florida Power and Light, who is poised to build one of the largest fossil fuel power plant in the country right next to the Seminole Big Cypress reservation. Everglades Earth First! is not the only group in opposition to the project, the Palm Beach County Environmental Coalition, the Loxahatchee Sierra Club, Palm Beach Green Party and South Florida Wildlands have also been working to fight it through litigation and public awareness campaigns. evergladesearthfirst@riseup.net for further information or to get involved. On April 9th 2014, South Florida Water Management District (SFWMD) released it’s draft Permit approval for the modifications to the Florida Scripps Phase II/Briger project’s Environmental Resource Permit. THIS IS GO TIME. This is the moment, THE PERMIT we have anticipating for years. Palm Beach County Environmental Coalition is calling on all of the people who live within the vicinity of the Briger Tract to contact us immediately if you want to join us in our petition for administrative hearing challenging the approval of this permit. Below is the initial submission to the SFWMD. I am writing to request a petition for administrative hearing regarding the above mentioned permits and applications. I received notice on April 10th that your agency was recommending approval of the permits mentioned above. You have failed to address the concerns brought up in the prior administrative hearing from Palm Beach County Environmental Coalition; have failed to provide documentation proving there will be no significant impact to water quality and refused to look at this on a cumulative impacts perspective which is irresponsible for the fate of the everglades bio-region. On behalf of the Palm Beach County Environmental Coalition, I am requesting you revoke the permit, and move towards preservation measures of the whole 681.54 to move towards true Everglades restoration practices. PBCEC has fought this issue for five years. We filed an initial administrative petition on June 3, 2010 (attached). This petition was filed by several members of the PBCEC. We have attended Palm Beach Gardens Commission meetings and made recommendations against the project moving forward. We have held several rallies near the site to voice our disapproval of the destruction of the Briger Forest. We held a rally in downtown WPB in May of 2013, in front of Kolter Industries. PBCEC has done extensive research into the wildlife impacts to the Briger Forest… please see our “Impact to Listed Species” (attached). We also filed a letter of intent to sue against the Fish and Wildlife and the Army Corps of Engineers, with the law firm of Myer Glitzenstein and Crystal on September 18th, 2013. Our interest has been demonstrated through the years of opposition to this project. At the time of application for construction the permittee shall submit a Hazardous Waste Management Plan. In addition, the permittee shall obtain any necessary permits from the Florida Department of Environmental Protection for treating, storing or disposing of hazardous waste. ~Signed and dated by Anita Bain and Anthony M. Waterhouse, P.E. On May 4th 2010. Also who will be monitoring Scripps as to what chemicals or radioactive substances they use and where they are disposed of? Since it is not mentioned it is unclear which agency is responsible.